Here at Bison we celebrate diversity. Last month, we held Diversity Week across our terminals: a week of learning and recognition of the many diverse employees in the Bison Family. We don’t just embrace diversity during this one week; we take pride in being a diverse company every day of the year. Billie-Jo Laird is making big strides in a largely male dominated profession. She is a Level 1 Tractor Apprentice in the Bison Maintenance Shop. Bison has seen an increased interest from women looking to get into this profession. Billie-Jo says she’s always been interested in automotive. As a single mom, she wanted to be able to pass practical knowledge down to her 7 and 8 year old sons. While she’s always worked in the restaurant industry, she wanted to make a change and decided there was no better time than now to follow her passion. “I knew it might be challenging but I didn’t mind. I like physical work and the shop environment allows me to just be me,” Billie-Jo said. Billie-Jo did her first work placement at Bison and was excited to return to work here as an Apprentice. “The shop is like a family. The Technicians all want to help me learn,” Billie-Jo said. Billie-Jo said she knew absolutely nothing about tractors coming into school – she hasn’t even driven a car in many years – but she was welcomed with open arms by everyone at Bison. She advises any female with a passion to do something outside of what might be a typical career choice to just go for it. Billie-Jo’s kids think their mom has a pretty cool job, too. Her youngest son has been telling everyone in his class that his mom is learning how to be a “heavy duty mechanic”. While it’s hard to balance such a physical job with being a single mom, Billie-Jo says she’s doing it for her kids. As for Bison, we’ve become an extension of her family. “Coming to work is like coming to an extension of home,” Billie-Jo says. “I look forward to it. There’s always something new to learn. This is what I’ve been waiting for”. 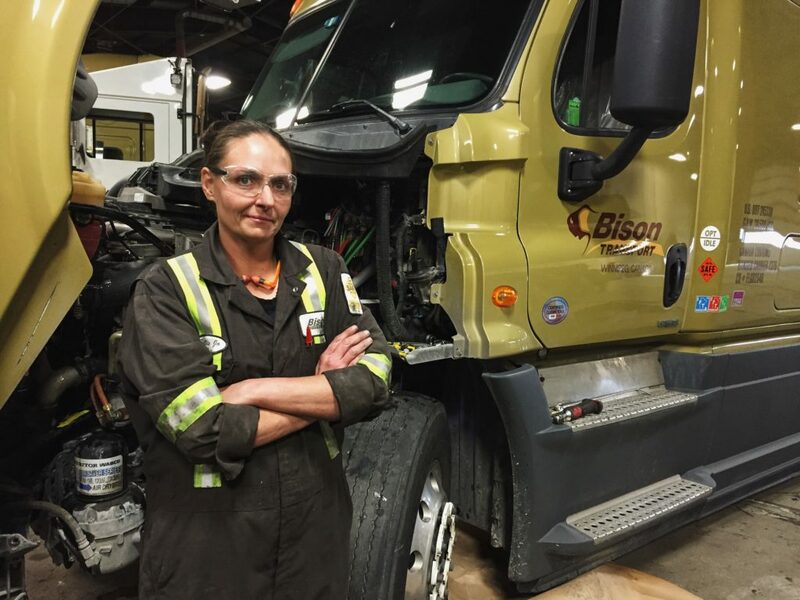 The Women in Trucking Association is a non-profit organization focused on the transportation and logistics industry, supporting women like Billie-Jo who are making strides in the trucking industry. "Our mission is to encourage the employment of women in the trucking industry, promote their accomplishments and minimize obstacles faced by women working in the trucking industry." Click here to visit Women in Trucking's website. If you are interested in a job as a Heavy Duty Technician at Bison Transport, click the button below! Practicing environmental sustainability the SmartWay!